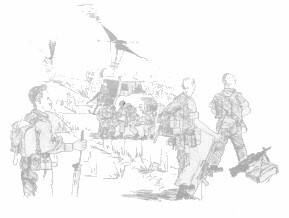 Between 18th of November and the 3rd of December, 1966, the Battalion was given a Search and Destroy mission in an area to the east of the Task Force Base. Particularly the operation was designed to destroy the Provincial Mobile Battalion D445 and its base. This operation was code named INGHAM. At the outset, the Battalion was moved by APCs to the edge of a rubber plantation north of the Base. An approach march was then made in an easterly direction for approximately 7000 metres, before the companies reached their search areas. The first contact was at 1445 hours on the 19th of November., C Company clashed with 6 local Viet Cong, resulting in the recovery of 4 packs containing food. On the following day, 100 metres from an enemy camp, 3 VC were fired on by B Company. 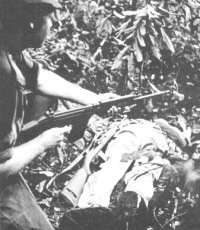 One Viet Cong was killed and 1 wounded. 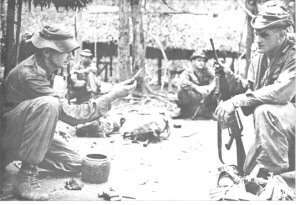 C Company also had two contacts on that day scoring 1 Viet Cong killed and 1 wounded. C Company sustained 1 man wounded by a Viet Cong detonated claymore mine. This was the pattern for the remainder of the operation; a multitude of contacts with small groups of Viet Cong, by all Companies. The larger forces had withdrawn, the smaller caretaker members of the enemy using delaying tactics such as Claymore mines and booby traps, to slow down the Battalion advance and to cover their own withdrawal. The armoured personnel carriers were also searching in the paddy areas to the south finding tons of rice and other food supplies and many camps. The area was inundated with camps of from squad to company plus size, and hardly a day passed without a report of an enemy camp being found and destroyed. C Company found the largest rice cache on the banks of the Song Rai River; a hide of 57 tons of polished rice. It took over a day to back-load the bags by Chinook helicopter. Mines were a constant hazard, and on the 22nd of December D Company suffered 1 killed and 10 wounded from an incident initiated by a Viet Cong claymore mine when sweeping down Routes 328 and 23. It was disappointing that no major contact was made with D445, but the operation did much to once again disrupt the enemy by destroying his camps and food stores. It is almost certain that the area was the recently established base of D445. All camps were thoroughly destroyed and many important documents and maps were recovered. Many documents and maps 3 radio sets 100 Ibs. beef concentrate 30 tins condensed milk 113 cans lard 700 Ibs. sugar.